At home my mom was used to love preparing for us strudel, which we would devour warm with a nice cup of Vienna coffee. Strudel is a famous pastry in cafes in Austria it is flaky and buttery and normally it is done with sweet and savory flavors. The history says that strudel was originally inspired in the Turkish baklava, Actually Austrian cuisine had influence of many cultures and cuisines including the Turkish, Bosnian, Swiss, Dutch, Hungarian, German and Italian. Strudel is also a favorite among the German and Hungarian cultures and it is prepared preferably with tart crisp apples. Since recently I found quince in Florida I got inspiration from my mother’s heritage and my great grandmother’s legacy and I created a new recipe using homemade quince preserves I prepared myself paired with Vermont white sharp cheddar and using commercial puff pastry. The combination of the quince with the cheese also celebrates my Spaniard heritage as I was used to eat cheese and quince paste for dessert when I was a child with my abuelito Angel who he himself was from Madrid. 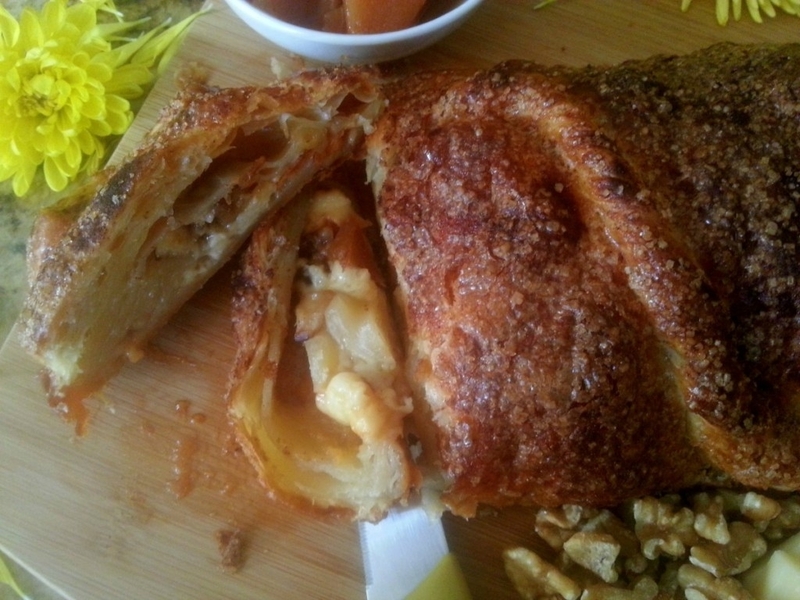 I invite you to prepare this recipe for Quince Cheddar Strudel, a delicious pastry dessert excellent to surprise any crowd including those football fans! Preparation time: 1 hour. Serves 6 to 8 slices. Cost per slice is less than $2.00 depending on the cost of the ingredients at your local supermarket. You will need a rolling pin, a baking sheet, a baker’s brush, a small bowl, knife, chopping block and spoons. Place the puff pastry in a surface and extend using the rolling pin and all purpose flour. 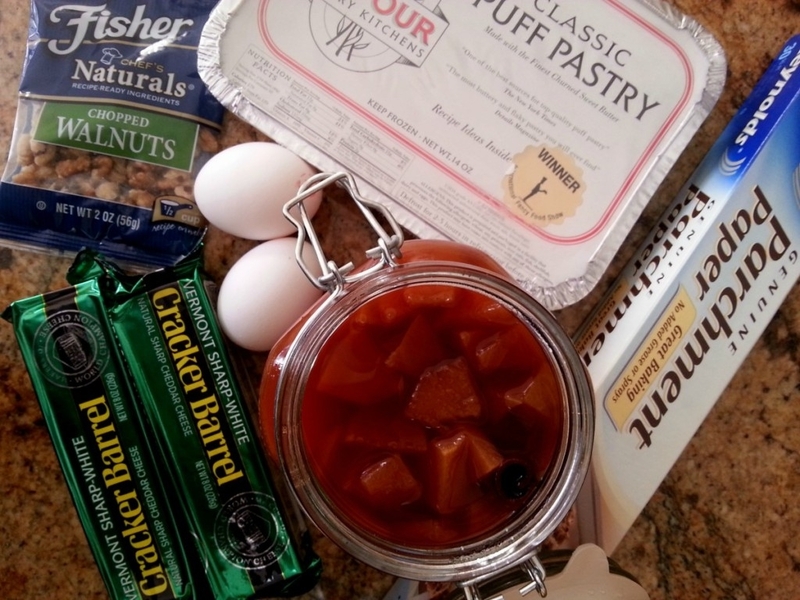 Start putting together the strudel by adding the cheese slices, the quince preserve and the nuts. Brush the puff pastry with egg batter to allow the pastry to stick and then do the first roll. Do the same thing for the second and third roll until getting the form of a horizontal package and seal the ends. Place parchment paper in a baking sheet, carefully take the quince cheddar strudel and place it on top of the parchment paper sheet, then brush the top again with egg wash and cover well. Sprinkle sugar on the raw and cinnamon powder. Bake the strudel for a period of 20-30 minutes at a 350 degrees Fahrenheit until getting a golden color. When ready take the strudel out of the oven and let it reach a medium warm temperature before serving. 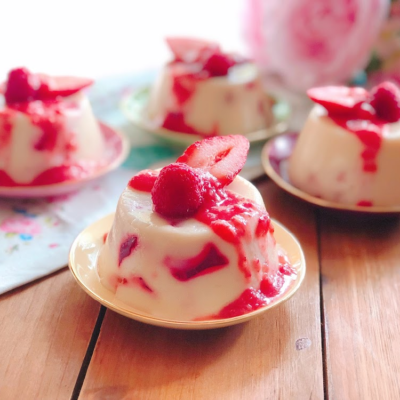 This dessert goes great with vanilla ice cream and paired with tea or a cup of coffee. The flavor profile is very nice, not too sweet and the cheese makes a great contrast with the quince, the walnuts are a nice nutty surprise. 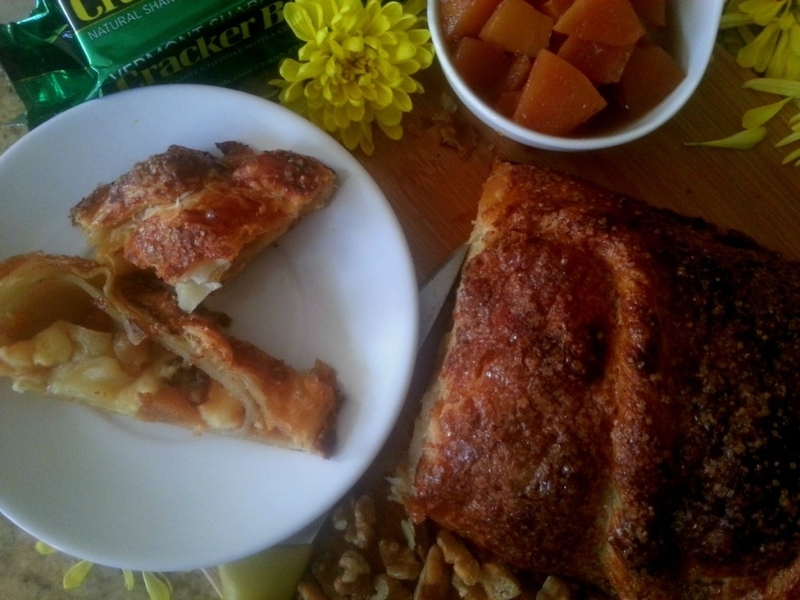 Quince and Cheddar Strudel Ready to Enjoy! I am in love with the creativity of this strudel. Is the quince paste sweet or tart? I’m trying to imagine the flavor profile! Stunning nonetheless. Hi Risa, many thanks for stopping by and for your kind comment. 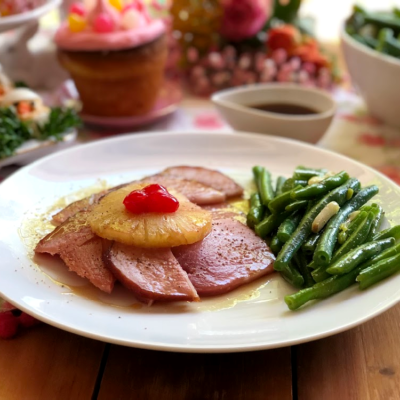 In this recipe what I used was quince preserves I prepared at home using my great grandmother’s recipe though if you want to use quince paste you can. The flavor of the quince is somewhat tart like a tart apple so the combination with the cheese really goes well. 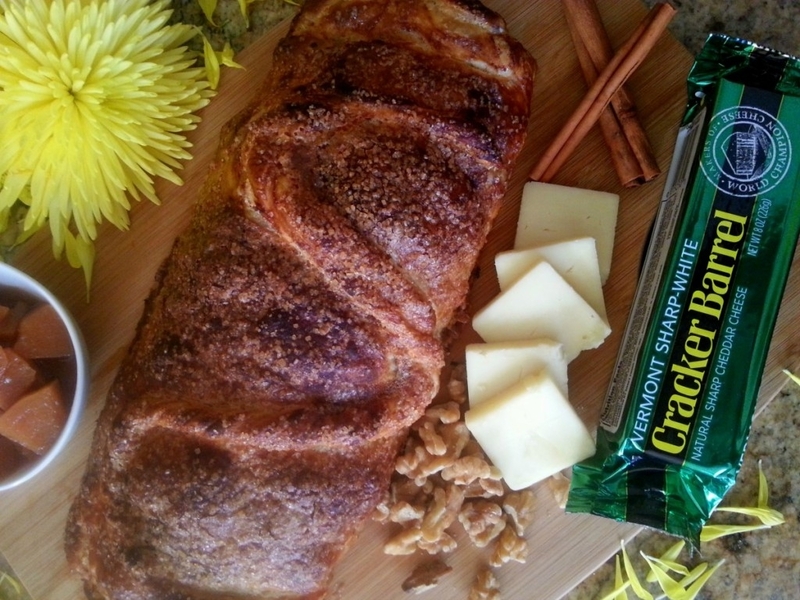 Have a wonderful day and loved your cheese crisps recipe too! Taty you are very sweet thanks for liking my recipes! 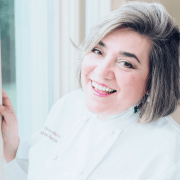 Adriana…I am so impressed that you made a dessert with this challenge! 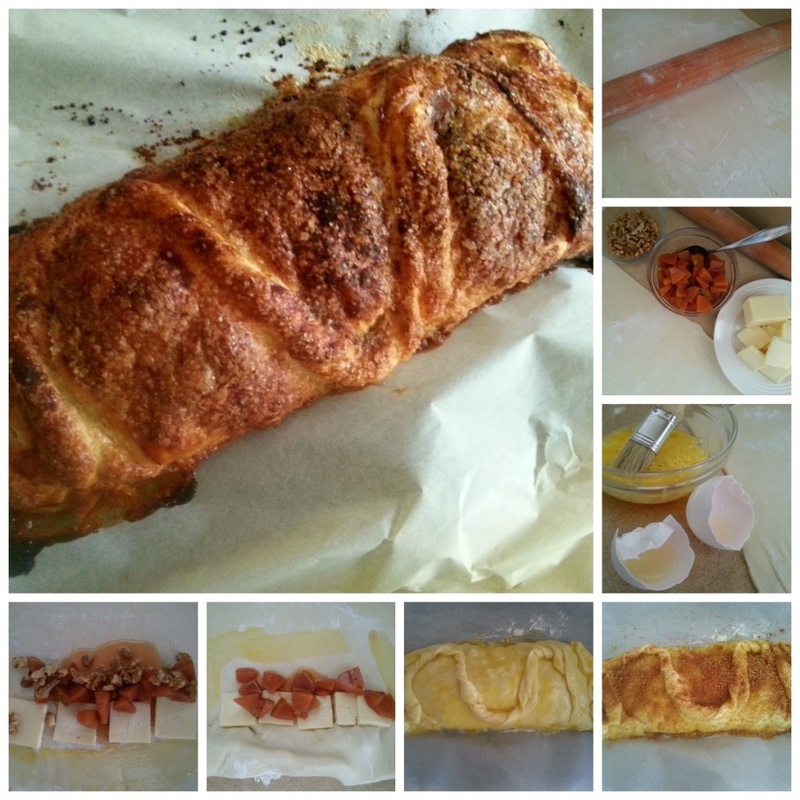 Your strudel looks amazing! I love the crust! 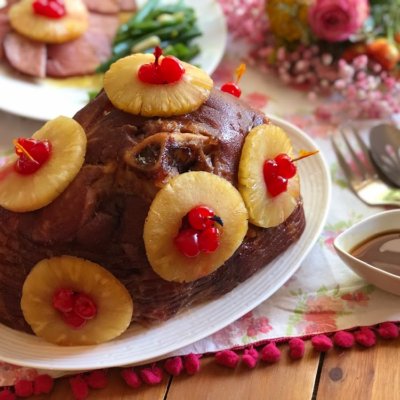 And just the right combination of sweet and savory! Many thanks Anne for your kind comments a do appreciate your visit and raving about my work. Have a wonderful 2014! This looks delicious. I’m fascinated that you were able to find quince; wish I could. Reminds me of “pastelitos de membrillo con queso” from Argentina, oh so good 🙂 Thanks for sharing your masterpiece. Ay querida I was so exicted when I saw them at Publix a dream come true haven’t eaten fresh quince since forever. That quince came from New England it is not grown in Florida. Why don’t you ask at your local supermarket or maybe Whole Foods. Enorme abrazo y feliz 2014! Awesome, I know Whole Foods here in Orlando does sell quince paste at the cheese aisle that could be an option to fresh quince if not found, sending hugs! Que cosa más rica a nosotros los argentinos nos encantan los strudels, gracias por la receta, Me parece un postre genial con un cafecito… Que rico!! Que deliciosa receta! Pronto la intento!! Desde ayer me tiene boba y con la boca hecha agua. Al fin pude pasar a ver la receta. ¡Buen finde!